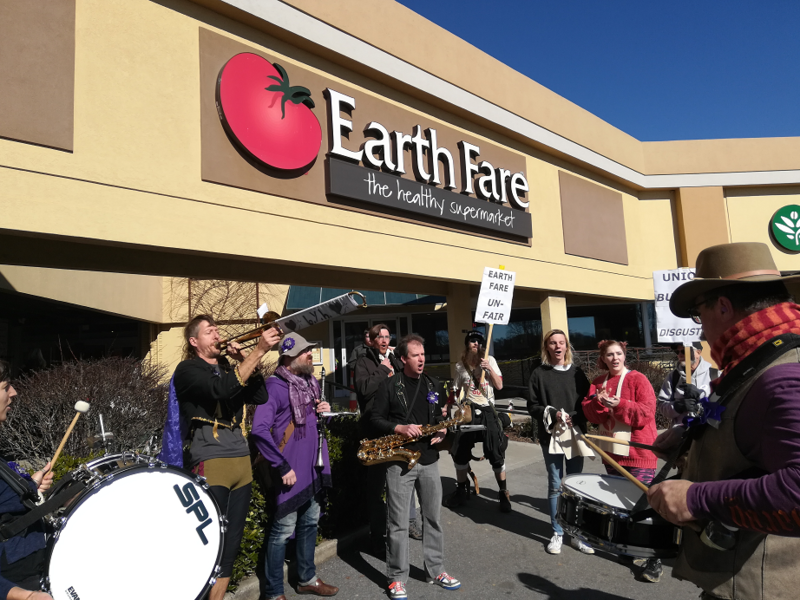 Dozens of demonstrators gathered outside of the Earth Fare supermarket in Asheville, North Carolina, on Feb. 2 to rally in solidarity with a former employee and union organizer who was unjustly terminated. 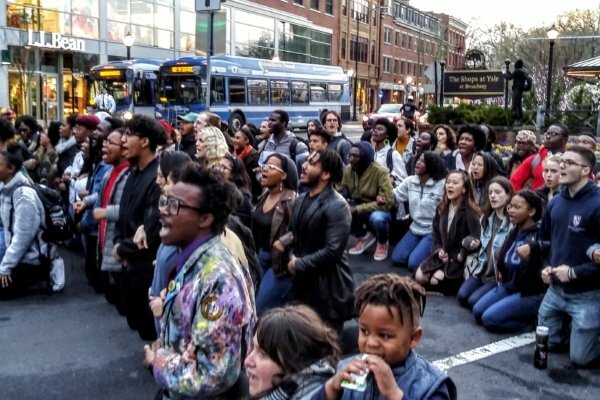 When assembling in the parking lot, protest attendees were immediately threatened with arrest by the property manager. 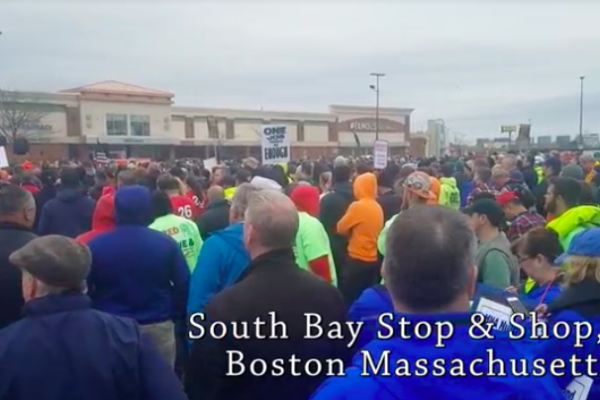 Despite the threat of arrest, demonstrators marched onward towards Earth Fare chanting and holding signs with messages of solidarity and support for the Earth Fare union. “For over a year, I have been involved with organizing the workers of Earth Fare to improve our working conditions and our lives. It has been challenging work that has pushed me to do what was necessary even when it meant retaliation from management, even when it meant losing friends. It was clear that Earth Fare would never out of the kindness of their heart lift a finger to help their employees in any meaningful way. 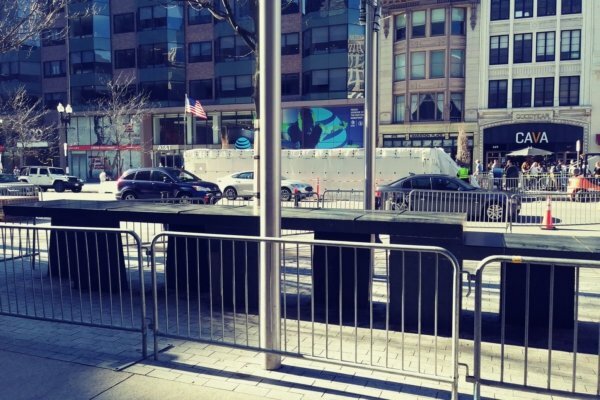 The heat has been broken all winter, and management has threatened to fire us if we complained. Black, Latinx and women workers are paid less, discriminated against, disciplined unfairly, and disrespected in the workplace. Trans employees are told to keep quiet about misgendering and harassment. Rats run through the kitchen, ceilings leak, equipment breaks and is never fixed, and valid concerns about our safety and well-being are met with threats or ignored. Two years ago, I had three teeth knocked out because of faulty equipment that produced unsafe conditions. To be fired after breaking bones and bleeding for a company that can decide to terminate me without warning and for no legitimate reason is outrageous. I was a hardworking employee. On the day I was fired from Earth Fare, I worked a full shift only to be notified after my shift had ended via text message that I was no longer employed. I was fired via text after leaving my shift to go to the clinic for my weekly Hormone Replacement Therapy injection, a fact that was suspiciously referenced in the text that store manager Cole sent to fire me. How dare I be trans and leave at the time I’ve been approved to leave work every week for years to go to my appointment? Due to the fact that no legitimate reason was cited for my termination, it is clear to me that I was fired for trying to unionize. Earth Fare is terrified of its employees uniting to collectively bargain and demand better conditions. To allow employees to unionize would directly subtract from their bottom line and get in the way of maximum profit. Profit for the few executives and investors at Oak Hill Capital who do nothing but happen to own the Earth Fare corporation. Meanwhile, workers at Earth Fare who actually produce this profit lose teeth, scrape by underpaid and disrespected, and are expected to be grateful for having a job. Charges against Earth Fare on behalf of the employee who was terminated have been filed by the National Labor Relations Board.